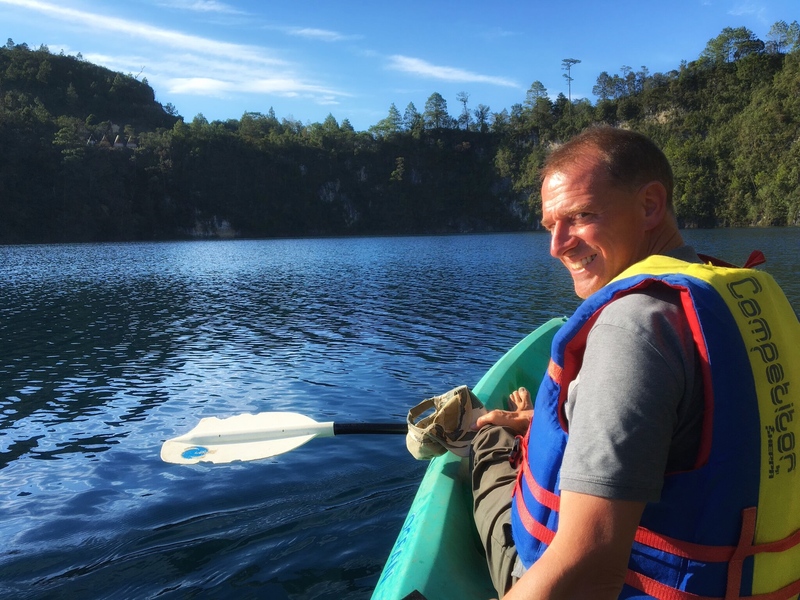 Late afternoon kayaking on a gorgeous Mexican lake near the Guatemalan border. Can it get more beautiful? Since San Cristóbal was so good we figured we’d stop at Comitán, one more old colonial town in Chiapas, for three days. Turns out you don’t find amazing surprises every time you turn around down here. To be sure, it was a cute town, but one day is really all you need to see the town, plus another to tour a lakes region nearby. 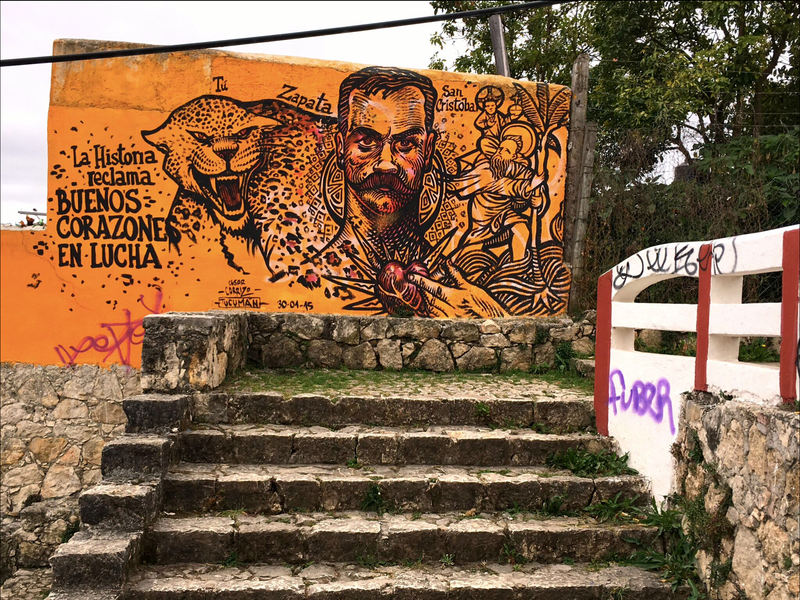 Comitán de Dominguez (the Dominguez part of the name was added in 1915 to honor a legislator who was martyred after speaking out against the dictator Victoriana Huerta) is about two hours southeast of San Cristóbal; two hours of blaring, slashing, exploding movies. 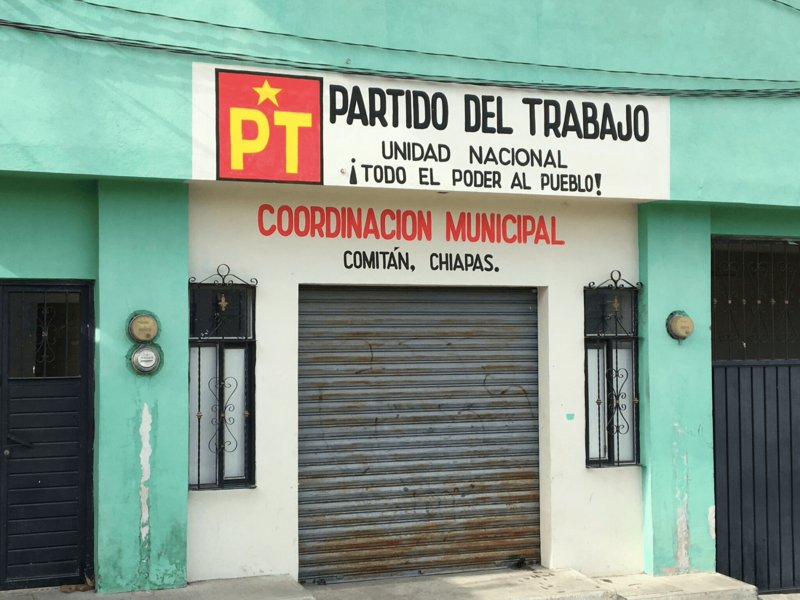 And – joy of joys – I got to do the route three times: down to Comitán with Mark, then back to San Cristóbal and back to Comitán the next day on my own when I realized I’d forgotten the wireless stereo speakers I carry with us up in San Cristóbal. It has a cute central square that was pretty lively both day and night. Our first evening there, for instance, a little local band was playing and couples were dancing and otherwise enjoying themselves. Walking along the stream up to the falls. And seriously, this really was the color of the water. Almost unbelievable. 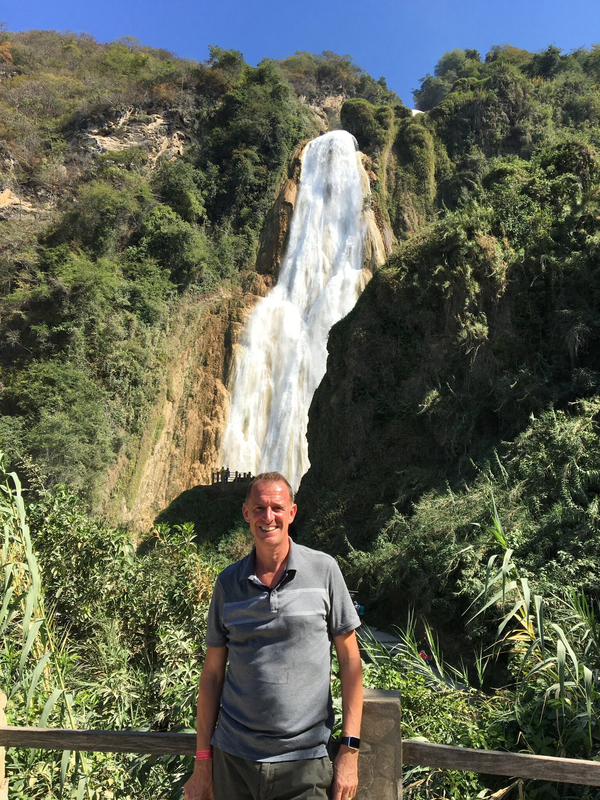 Besides being an opportunity to break up the trip down into Guatemala, the big attraction in the region is a bunch of water nearby. El Chiflon is a series of waterfalls with exceptionally beautiful turquoise water. We hired someone to drive us out there and he dropped us off at a stream where we had to pay all of $1.75 each to walk up stream, and then further up and up. It was a beautiful walk, calm, peaceful, sweet smelling, with smaller falls all along the way. When suddenly we spied the 375-foot main falls we were pretty much blown away. It was impressive. Mark at a bit of a distance in front of the big falls. You can see just to the left of his head the more proximate viewing platform that we were ultimately headed for. 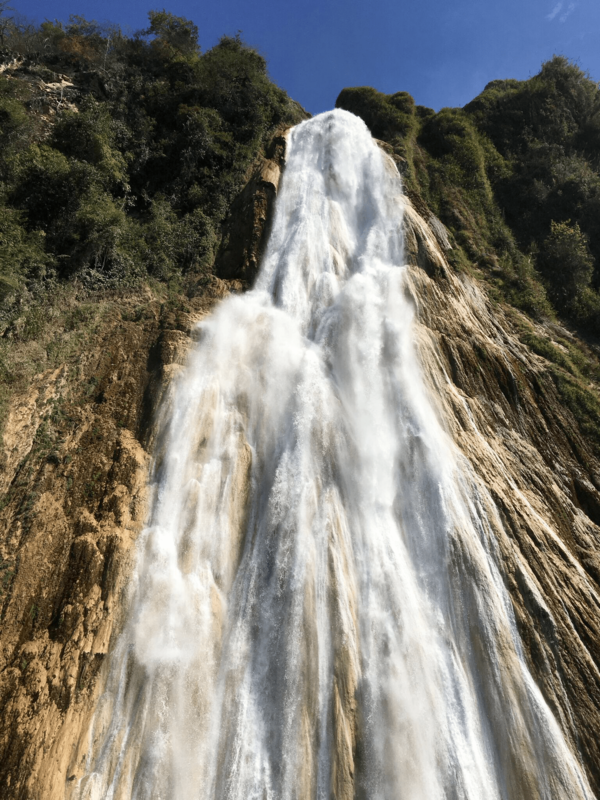 After a series of smaller falls, you suddenly approach Velo de Novia, the 375-foot major falls. Powerful and beautiful. 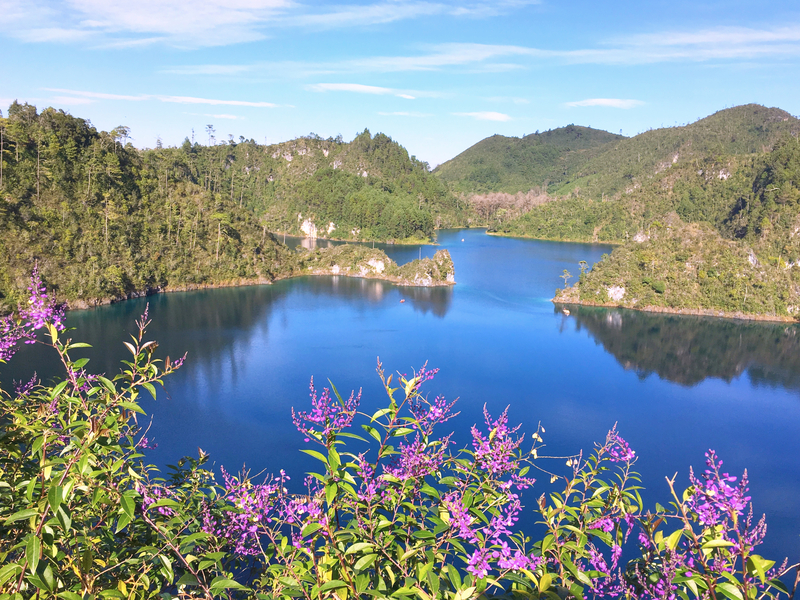 Then we continued on to Lagos de Montebello, a series of lakes down along the Guatemalan border. Again, truly beautiful with spectacularly blue, clear water. It reminded me of being in Northern Minnesota so naturally I went swimming in one of them. At another we went kayaking for 45 minutes or so before heading back to town for the evening. So that was Comitán, a quick stop in a cute but ultimately uninspiring town. It was memorable for one reason, though: we celebrated 1,000 days on the road here! Yup, it’s now been over a thousand days since we left Cambridge in 2013. So far we haven’t found the place where we want to settle down so I guess we’ll keep going for at least another thousand days. Meanwhile from here now we cross into Guatemala tomorrow. Exciting! And lounge I did. I mean, who could resist plastic pink Adirondack chairs? 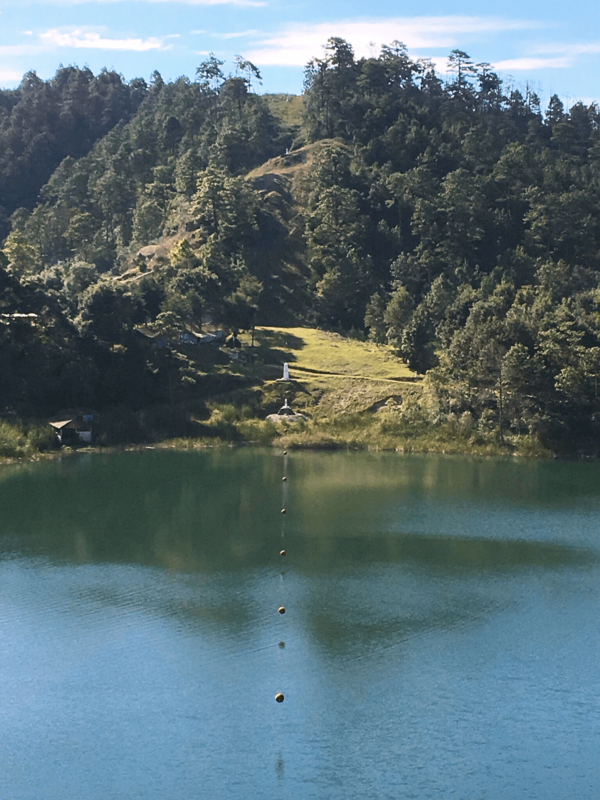 The Guatemalan-Mexican border running through the lake and up the hill. You can see the markers all the way to the top. Donald Trump would hate it: you could (and we did) just walk across the border back and forth with no controls. It was strange to walk into Guatemala and then back into Mexico knowing that the next day we were driving back to cross the border seriously. And finally, another of the lakes. This is the one we kayaked on. How is it that I travel the world only to fall most in love with a place that looks like Minnesota? Mark outside the Cathedral. In just a couple weeks Pope Francis will be here! 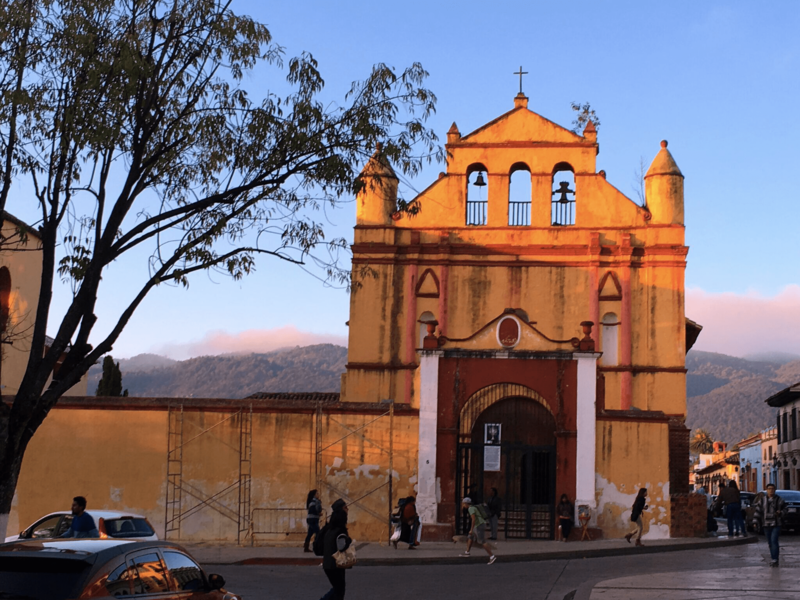 A five hour bus ride took us from Juchitan to San Cristóbal de las Casas, our first stop in the state of Chiapas. Wow – what a city! If the goal of our travels is to get to some of the less-traveled parts of the world, this was what we were aiming for. Make no mistake, there’s plenty of tourism here; it’s one of the city’s major industries. But until we started looking at going overland from Puerto Escondido to Guatemala I’d never heard of San Cristóbal, a city of nearly 200,000 people that is the cultural (though not political) capital of Chiapas. What a shame it would have been to have missed it. It’s worth noting that while we hadn’t heard of San Cristóbal, and we suspect that most American tourists haven’t been here, it’s not entirely a secret. In just three weeks the Big Guy – Pope Francis himself – is coming here for a day. He probably won’t have the same experience we did, but the city is already getting excited about his visit. Pictures of him are popping up and the Cathedral is getting repaired and painted. You don’t have to be a Catholic, or even a Christian, to get a sense of how big a papal visit is to a city like San Cristóbal. 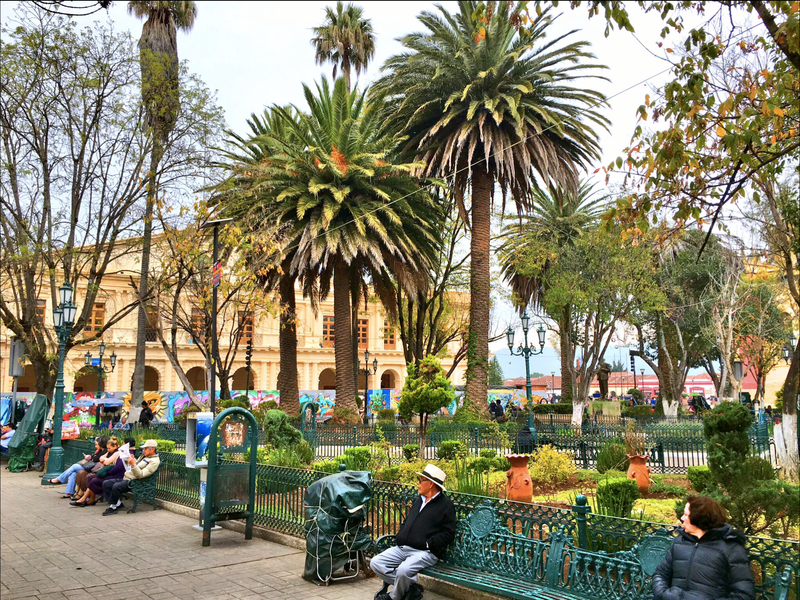 In our travels over the years we’ve been to several great, beautiful old Spanish colonial cities: San Miguel de Allende and Oaxaca in Mexico; Antigua, Guatemala; Cartagena, Columbia; Granada, Nicaragua; and Cuzco, Peru come to mind. Now we add San Cristóbal to that list. Red tile roofs, cobblestone streets, wrought iron adornment, and vibrant colors. Then add to all that the pedestrian ways lined with cafès, restaurants, bars, mezcalarias, and shops and you have a pretty great set up. I told Mark the next time he wants to stop for a few weeks to study Spanish this is where we’re going. 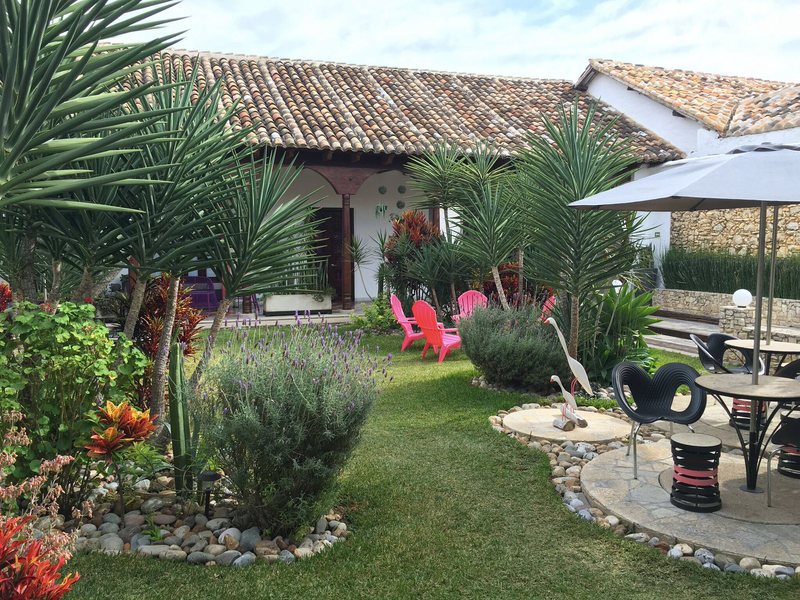 Now admittedly, there’s not a heck of a lot to do in San Cristóbal. The pedestrian streets are fun, and there’s a great market next to the Santo Domingo convent. Some churches worth poking around in and a few cute little parks for sitting and reading and people watching. But everywhere you walk it’s just pretty. And – this is key for us, of course – the restaurants were little short of amazing. One meal in a Neapolitan restaurant where the owner was indeed from Naples and (except for one unfortunate dish) the food was every bit as good as you’d get there. Dinner at a tapas bar whose owner was from Barcelona – and whose wife was from Basque Country. They knew a thing or two about tapas! A Thai restaurant where the food really could burn the hell out of your mouth. And of course great Mexican food everywhere. The market had beautiful fruits and vegetables. The most beautiful radishes ever, though we didn’t get great pictures of them. So we loved San Cristóbal. Getting there, on the other hand was hell. As I mentioned earlier, Mexican buses can be extremely comfortable. I just don’t understand, though, why they have these crazy loud obnoxious movies blasting, the bane of my bus-riding experience. You can be on a long bus where everyone is trying to sleep and they’ll be blasting some slasher movie at insane volumes. Maybe three or four people at most watching it, but – for me at least – utterly impossible to read or listen to my own music because of the blaring volume. I can’t fathom why people don’t complain; I did, but either the driver didn’t understand me or chose to ignore me. There are times when the bus ride can be pleasant, relaxing, and a great way to get around. But you never know if you’re going to end up on some hellish ride with an excruciating soundtrack of exploding bombs, crashing cars, and slashing sword fights. And we made one rookie mistake. If you look at a map and find San Cristóbal down near where Mexico meets Guatemala, you’ll see that it’s way far south, as far south as you can get in Mexico. And Mexico is warm. So, we figured San Cristobal was warm, too, right? Oh, wait – we forgot to check the elevation. Turns out the city sits at about 7,000 feet above sea level meaning that year round the average daily temperature is in the 50s and 60s, with January (not surprisingly) at the low end of that range. Once the sun went down the temperature would quickly fall into the 40s which is cold for us these days. Interestingly, though, the locals make almost no accommodation to the weather. There appears to be no such thing as indoor heating. All the restaurants and cafés had outdoor seating that was in constant use, all without the outdoor heaters you seen all over Europe. And if you go into the restaurant? Doesn’t usually do much good since there’s no heat there, either, AND the doors and windows are wide open. So we were dressing in our full winter clothes to go out. As for sleeping, though, it was heaven. Of course, it didn’t hurt that our all nine rooms in our little hotel had their own fireplaces. So every night wen we’d come back from dinner they’d make a fire in our room. Maybe that’s why I loved San Cristóbal so much! The Church of Guadalupe was on a hill east of the city, while the Church of San Cristóbal was on a hill west of the city. Naturally, we had to climb them both. This creative graffiti was on the steps up to the latter. Another church, this one in evening shadows. Part of what I like about this is the background; it reminds me that San Cristóbal is in a valley, surrounded by big hills. Something I observed the day I rented a bike and tried to ride out of town. Yikes! 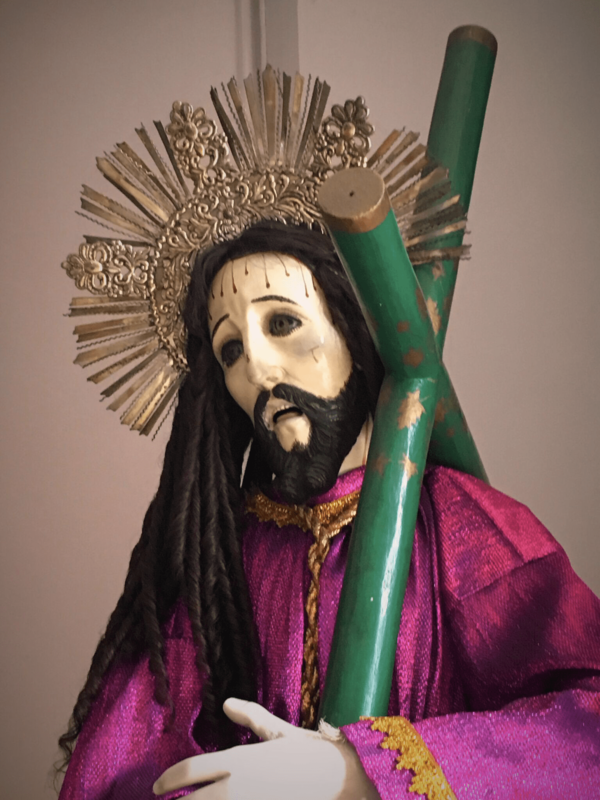 There are a lot of churches in San Cristóbal and, unlike the churches in Europe, these are always in use. This was the particularly beautiful San Lucia. OK, one last church. I don’t even remember what church this was, I just loved all the banners and colors. And one last picture of beautiful, fabulous San Cristóbal. We’ll be back! These two stops were a continuation of our overland trip across the state of Oaxaca en route to Chiapas and then on to Guatemala. First stop was Bahías de Huatulco, Mexico’s newest planned tourist development area. 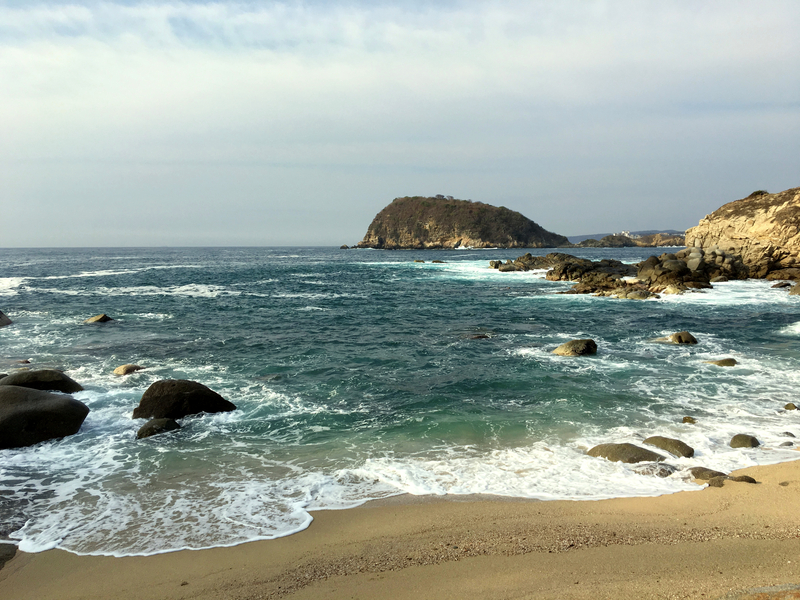 Unlike Cancun or Ixtapa, though, Huatulco is still pretty low key. The tourist area spans nine bays along the Pacific coast with lots of undeveloped space between them. There’s a relatively local town known as La Crucecita where we could go in the evening for mescal and some decent food. And to watch the end of a painful Green Bay Packer playoff game. While much of the tourism here centers on big all-inclusive resorts, we stayed at Villa Fa-Sol, a little place with maybe 15 or 20 rooms built up on hill over a tiny private beach. It was a pretty space, though our room suffered from one of the great sins of beach resorts. Our room had a big sliding glass door with a view of the sea, but even though we were on the second floor it opened onto the passageway that others would use to get to their rooms. So yes, there was potentially a great view, but you had to keep the shades fully drawn if you wanted any privacy at all. Just one of those “what were they thinking?” moments. One of the great things about the hotel, though, was a big breakfast table where you would sit with other guests and chat, get to know them, talk about what to do and what to see in the area. Definitely leads to a more social atmosphere than separate tables for everyone. One of the things we learned our first morning there was that the best beach in the area was in a private residential development just down the hill. 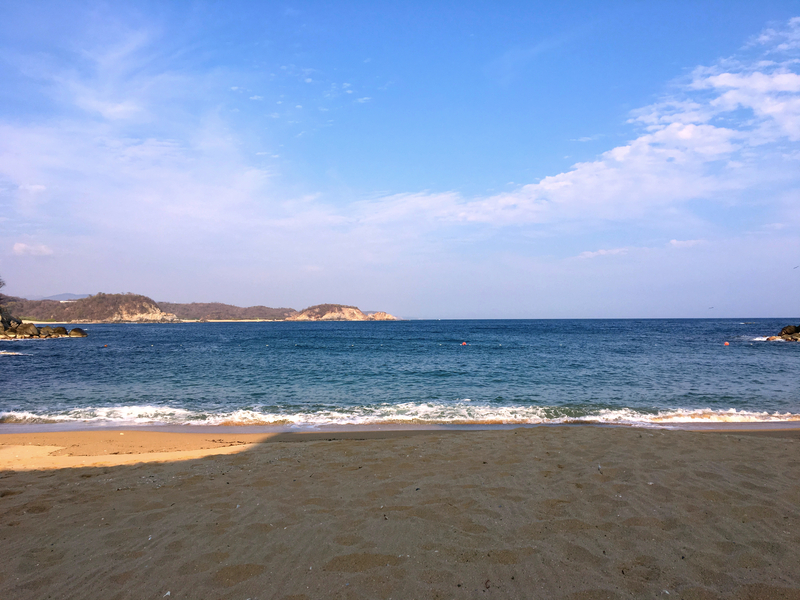 You could get a day pass that covered your lunch costs and use their beach all day, so that was how we spent our two full days in Huatulco. It was apparent, though, that this new development had blocked the sea view and access for most of the local community. Allegedly, former Mexican President Vincente Fox gave development rights to a friend on his way out of office. Sad. After three days in Huatulco it was off to Juchitán de Zaragoza. Since we’re working our way down to Guatemala I always want to say we were going south to Juchitan, but because the coast here runs largely east-west, we really headed northeast to get there. Bus rides in Mexico are interesting. The buses, so far at least, have been genuinely comfortable – big and cushy – but there’s always something. Speed bumps, for instance. Apparently Mexico just loves speed bumps and in some places, particularly in built-up areas, they’re just one after another, with the bus and pretty much all other vehicles slowing to all but a full stop to get over them. One report I saw said that there are 200 speed bumps on the route form Acapulco to Huatulco, seriously inhibiting the kind of domestic tourism that would fill the resorts down here. And the temperature. You can never tell if the bus for any trip will be warm or have the AC blasting. The bus to Juchitán was the latter; arriving there I was wearing a heavy sweatshirt and still pretty much freezing. 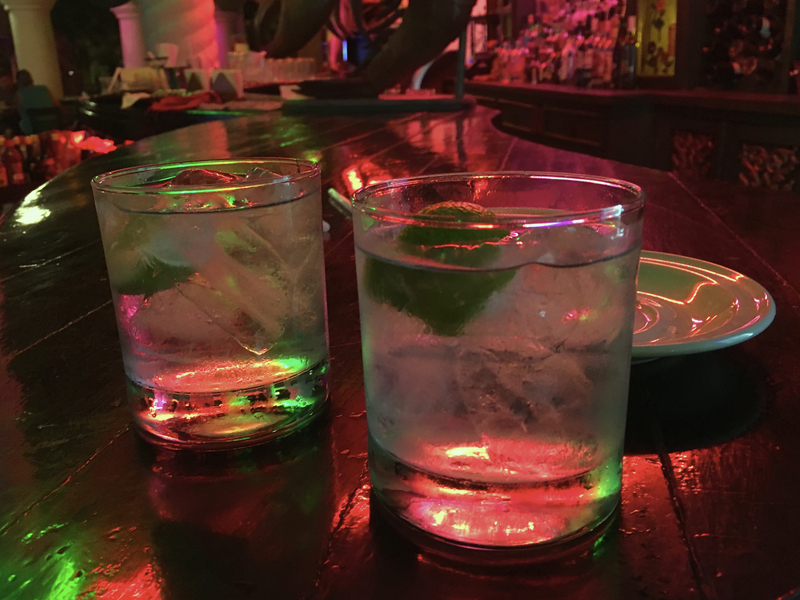 One of our favorite sites – Absolut Vodka with a little fresh lime squeezed in. We liked this restaurant, but unfortunately I’m pretty sure the vodka was watered down, and not just by the ice in the glass. 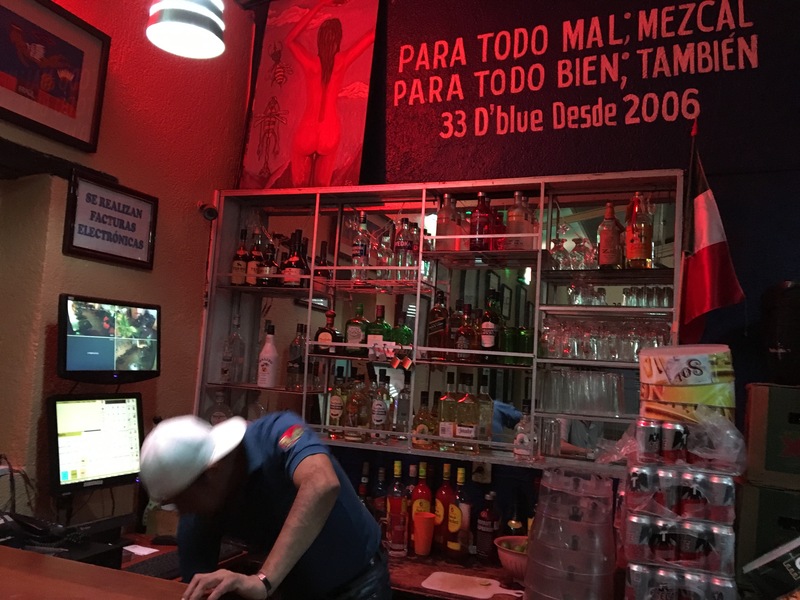 A friendly local bar in Juchitán. The sign above the door translates something like “For everything bad, mezcal; for everything good, the same thing.” Works for me! 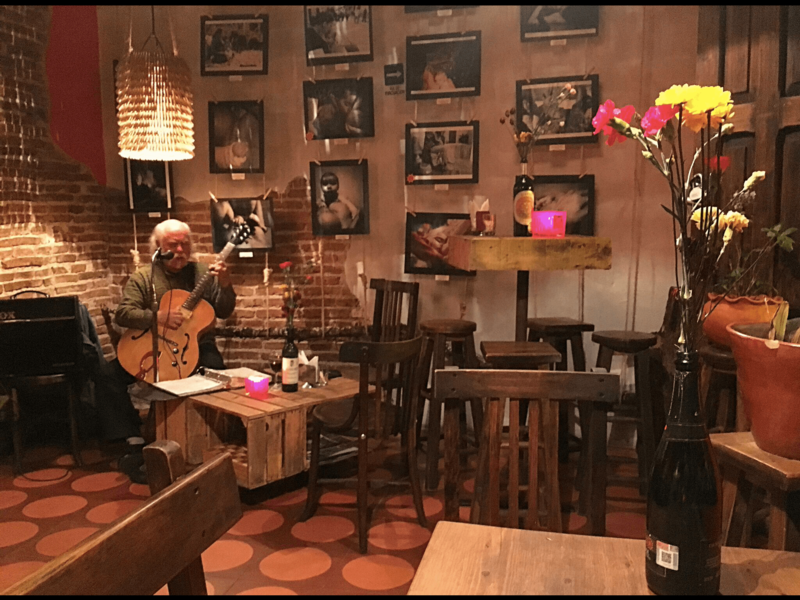 It turns out that arriving at 7:00 PM and then leaving the next morning at 9:00 AM doesn’t give you much time explore that unusual aspect of local culture. At our pre-dinner stop for a couple shots of mescal at a typical local bar, though, we were nearly certain that the woman making our bar snacks had been born as a boy. We’re intrigued to find these little oases of decency in a too-often hostile world. Intrigued and curious, of course. Why here? Why here and not everywhere? We’ll keep looking for answers. Meanwhile, after our quick one-night stop in Juchitan it’s off on a long bus ride to San Cristóbal and then eventually to the Guatemalan border.